FREE E-book shows the exact 7 things hundreds of successful businesses are doing to generate new leads, new clients, and more profit. Don’t Ever Delete Your Old Blog Posts! Posted on July 12, 2011 | by Tim | 1 Comment on Don’t Ever Delete Your Old Blog Posts! All the backlinking you have done for each blog post, such as twitter, facebook, and that bulk of social bookmarks, will be invalid. Those backlinks wont disappear, even worse, they will just give people that try to go to your site 404 errors and never see your site. At least if it is just a bad post or ireelevant post, they can browse your site and read other content, if you don’t delete the post. Also if someone else linked to your post in their blog, people that read their blog will get errors and tell that blogger. That could lead to them not linking to you anymore for the fact they do not want it to happen again. So you could lose out on future link juice as well! Blogging frequently gives you good SEO benefits over other companies and websites. We know this. Every piece of content you write adds more search engine juice for you. Deleting a post will remove the benefits of that. By the time you have blogged for a few months regularly, your site gets decent traffic (if you have been doing proper SEO!). Imagine where you would be without any of those blog posts; you wouldn’t have that SEO traffic! Don’t delete your posts. The more blog posts you have the more legit your site and company looks. Each blog post is actually a lead generation tool! Or lead generation opportunity. I actually still get inqueries from a blog post that is over a year old, because it is indexed in google and ranking, and people get the number from that post. If you delete that post, you delete that reference, and therefor that lead opportunity. 4. Basically, you waste time. Trying to figure out what to write about can be a long process, then actually writing it and formatting it the way you want (this post took me 2 days). Maintaining and creating a blog takes a lot of time and effort! Now I am not saying I’d rather have a blog with 365 posts of junk content over 12 posts of super quality, at the same time I want a good amount of content and do not want to delete them after the time I took to post them. What are your thoughts, did I miss out any reasons not to delete posts, or do you think its no big deal to delete blog posts. Put your thoughts in the comments. Posted on March 2, 2011 | by Tim | Leave a Comment on New WordPress Shortlinks? Has anyone else seen these new wordpress tool bars on their wordpress blogs now? 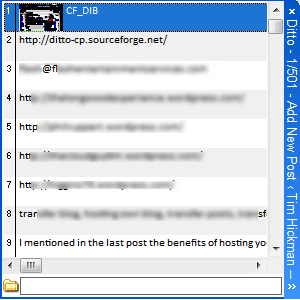 Strange thing is, I host my own blog on my own server, but the toolbar is there, but I assume only when you are logged in. More importantly, it has a ‘shortlink’ kind of like the bit.ly service. This URL could become useful to send out, especially on sites like Twitter, facebook etc. I noticed it on my blog writing service site. This is what the shortlink looks like: http://wp.me/1eNcW (shortlink for my blogging service, not here). As of yet there does not seem to be any form of link tracking, such as bit.ly by adding a + at the end (read my article on bit.ly tracking here). Perhaps that could come down the line. Here is a screenshot of the toolbar in case you have not seen it yet. (click for larger picture). You can also use the shortlinks for individual posts, which I discovered linking to the other post. In the edit posts or new posts page, where the permalink is, you click “get shortlink.” Neat feature. This week’s Fan Of The Week (FOTW) is Karen Mccarthy, of CalypsoIT. Thank you for contributing to my sites and facebook page, and here is the favor returned! If you’d like to join in on my FOTW and would like to be promoted via my blog, facebook, Twitter, and Linked In, and then social bookmarked ALL over the web, all you have to do is comment, post, or reply on my blog or facebook page! Okay there is a lot of hype about this guy Trey Smith right now. And I really do not know why. He creates these few videos on the most basic knowledge and people are treating him like a God. His first video okay perhaps is helpful, teaching people you can TOO make iphone apps. I knew this awhile ago, almost did it, but actually getting your app into the app store is NOT easy. His third video “The Black Box” hypes about this “almighty secret” that no body knows about. Its the “secret that got Bill Gates rich!” Do you want to know what the secret is before giving your precious email account away to some unknown guy? The secret is the word: Software. That is it! He talks about how great software is, and then updating it is. And how by having updates, it gets people like Bill Gates rich. This is the secret of Windows. On top of that, all of thse people are singing his praises for this information. I did not realize the internet was full of complete newcomers, to not understand how software and updates work. When you purchase software, and there is an update, and you pay for it, that is how you get rich. I give it to Trey for having enthusiastic videos and such, and I guess internet newcomers is his market, I just did not realize people do not know the basics of software and updates. I do not know where Trey Smith came from, he popped out of the blue and has these professional looking videos. I am going to stay away from him, his knowledge has no use to me, perhaps it does others though. Although I guarantee most people will not do his course, which is about making iphone apps. What are your thoughts, do you like Trey Smith or do you agree your basic knowledge surpasses his information? Leave a comment below or on facebook. I went to a discount book store yesterday in my area. It formally was a Forman Mills (For-mon Mills!) That jingle always gets stuck in my head. Anyway, it turned into a bulk book store. I will have to say I was less than thrilled going in there, epecting a huge store. There was not a big selection. it could have been that they ‘lost their lease’ (how does that happen?) and so they were not getting any new books. Everything was at least 80% off. Their business selection was small, but they did have one good book that I have. Then I came across the “Complete Idiot’s Guide” section. I usually hate these form of books, but two caught my eye, but I picked up one: “Social Media Marketing.” SInce that is my next venture I figured it could be a good read. Although even my friends joked “You probably could write that,” I bought it anyway mostly for the fact this $19.95 book as $3.15. I could not complain. So I will be reading this lately. I will make an updated post(s) on whether it is a good read. I picked it up though, so right there I at least recommend it for even new comers. I don’t buy too many books, so if I do it usually means to me it has some value. I just wanted to make a post about a great site I use all the time, mailinator.com. By no means is this site new, and I am not saying it is. It is just a great tool to use to avoid spam. Basically, if you need to input your email address somewhere but you don’t really want to give out your true email, you make one up @mailinator.com and you can instantly access the mail. Such as spam@mailinator.com. No password needed. You just go to the site and put in what you entered, such as “spam” in the box saying “check your inbox” and there it is. Only thing is anyone else can use it too so do not put valuable information in there such as social security or any passwords you actually use. It is a great tool, but a lot of services automatically block it now. Some software such as some auto-responders auto block anything from an @mailinator.com email, so you wont be able to use it. So what are the repercussions of a service like this? Nothing, for you, but for merchants and people that rely on collecting your email, such as internet marketers, it can actually hurt their business. Internet marketers sometimes make visitors enter their email addresses before being able to access something good like an ebook, or a video. That way, they can market to you in the backend, by emailing you. This is how they usually stay in business (and thus can continue to give away free ebooks!). This is very common now, whether or not using that site or just using a spam filled email account, users are on to marketers trying to get their info; especially new marketers. If they don’t know them, why trust them? As for seasoned marketers, such as Eben Pagen, people know and perhaps trust his products, so they are more likely to put in their real information. But in any case, one starts to wonder if it has gotten to that point where asking for an email for a free product and being joyful for having thousands of new ‘subscribers’ may be useless now, as most people just put in a fake or spam filled email. That they never read. Where is the value in that? What are your takes on this? Do you think most people put fake emails in now? Okay, all I can say really is, “wow.” This site is too much. I recently discovered this site, spokeo.com. It claims to be able to find people and information on those people. You can start a free search, but the ‘good’ results cost money to retrieve. Luckily, it does give you some info for free. Doing a simple search for me and my state, I found me, and my last address. It also listed my family, which was correct. Age would have been a few years off, and perhaps house value (but not sure). It was correct in stating I am, in fact, a male. I did a few other searches and it is cool, but the scary part comes when you click the ‘friends’ tab on the site. It can connect to your emails (like how facebook does to find friends) and shows profiles, pages and even pictures you may have never seen before. It showed photo’s of one of my friends that I’ve never seen before. It was cool, yet scary at the same time. So what is useful about this site and its information? Well on the good side, you can use this site to keep an eye on what information about you is out there on the internet. I was able to realize my main email address is not circling around and neither is my cell phone. But then again, who knows how outdated the information on the site is. It still showed my last address which I moved out of 4 months ago. It also can be a cool tool to find your friends profiles and pictures. On the other end, it could be used by other people to stalk you, and try to get as much information about you as possible. As I said, you can get their age, address, number, even whether or not they are single. They could find incriminating photos and misuse them. Employers could also use this site to research about you. People can use this information to check up on someone before a date. THere are many uses. Also, all of this knowledge is based off of the free information given on the site. The information released to you after you purchace could be a lot more. They show that they could find hobbies, age, income, house value, email address, photos, videos, social networks, etc. So be careful, and notice what information is out there on the internet about you. The internet is NOT as private as you may think. I ran across a Beta for a new spy tool coming this year, called AdBeat. I have to say it definitely has the potential. It could very well be either a favorite tool of mine or one of the top tools of 2011. I am just glad I found it now. Soon, every opt-in list and google ad will be marketing this thing like crazy and it will be the talk of the town. And if you get in now, you can get in while the Beta is still going, which I heard might not be much longer. Maybe a month at max, or in as little as a week. So you can run it for free for now. Basically, it helps you spy on other marketers and affiliate marketers to see what their top performing ads and campaigns are, which you can then target. I will be the first to say I am no adwords expert. There are adwords experts out there, and this allows me to take the guess work out and have a better performing ad in a few minutes (compared to guessing and tracking results with split-testing for hours). Their website can give you more information than I can. Go check it out, it is definitely worth it. And check it out before everyone else gets to it. You for sure won’t regret it. Okay, I bet everyone is thinking ‘what the heck is so great about copy/pasting?” Or what is it that hasn’t already been done? Normal Windows Copy/Paste feature works with whatever you last copied, that is what you can paste. But what about that time when you copied something, then copied something else, and wanted to paste that first thing? You are out of luck! Welcome: Ditto. I got it actually a year or two ago and I havent looked back. It is on all of my computers. Basically what makes it so great is it has a database, and you can store an infinate amount of copies (I set mine to 1,000 any more it might be very slow). and it does not only copy text, it works for images and Print Screen captures as well. I know files that are copied show up in it as well, but I have never tried to re-paste a copied file, but it should work. It also has a preview, and an alt text so you can see what it is. Obviously, being able to search 1,000+ copies it has a search. You just start typing in the program and it will find it. I am writing this actually because I just used it, to find a link I copied probably last week. I actually use it all the time. It really is one of my favorite softwares for Windows. Of course the best part of all is that it is FREE. So go check it out. Click for Ditto. I recently discovered CyStats for wordpress, as I needed it for another plug in I recently installed. I have got to say it makes it easy to see all your stats right here in the WordPress backend. 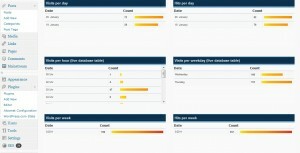 No need to go to your CPanel to see stats etc. A lot is laid out right in your WordPress sidebar. And for those curious as to how it compares to WordPress built in stats, I can say it is much better, and more detailed. Plus, it is free. I can see it is already doing its job. 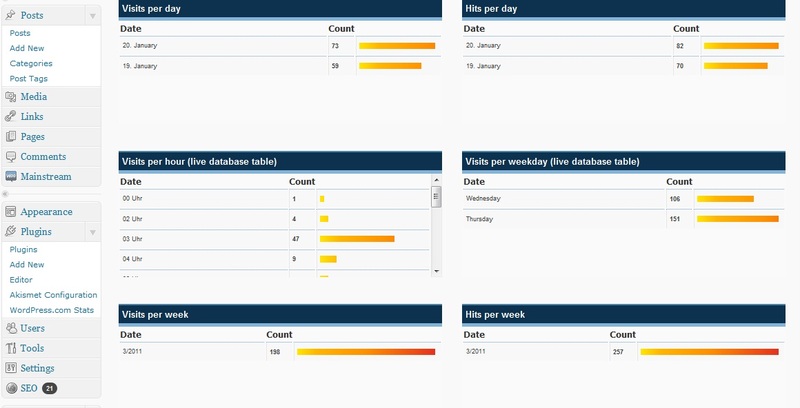 Here is a screenshot from the CyStats Time page. “TIME FOR RESULTS,” the 7 things successful businesses are doing to generate new leads, clients, and more profit. © Copyright 2019. Tim Hickman. All Rights Reserved.